This week in Bangkok, Thailand, governments reconvene under the United Nations Framework Convention on Climate Change to negotiate the implementing guidelines for delivering the ambitious Paris Agreement. Neil Bird of ODI highlights some practical pointers from expert group PACT (the Project for Advancing Climate Transparency) that could help negotiators on their way. With the December 2018 deadline to operationalise the Paris Agreement looming, climate negotiators head to Bangkok for the final technical session before the next UN climate talks in Katowice, Poland. They are faced with the herculean task of pulling together volumes of draft notes and the disparate views of negotiating blocs into comprehensive implementing guidelines to be adopted later this year. A new paper from the PACT – Setting the Paris Agreement in motion: Key requirements for the implementing guidelines – provides both an overarching vision and practical suggestions for what should be included in the main pillars of the implementing guidelines. It is a strong complement to the informal tools released by the negotiation co-chairs last month, which gave guidance on how to structure the next round of discussions. The PACT consortium is composed of nine universities, institutes, and nongovernmental organisations from around the world. It aims to advance robust and effective transparency and accountability rules and processes for the Paris Agreement on climate change. Bringing together the core requirements into a complete package of mutually reinforcing guidelines that leverage the linkages between these elements. The paper’s recommendations build on the authors’ 20 years of experience under the UNFCCC. The Paris Agreement implies that a cycle of planning, implementing, and reviewing progress on climate actions is essential and that implementation guidelines will be necessary to support this cycle. 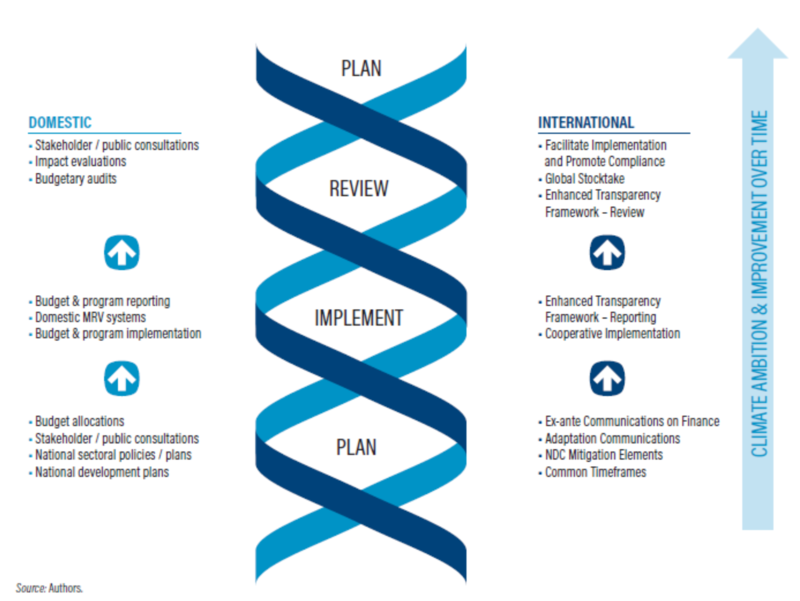 The plan-implement-review cycle applies to a country’s actions both within the international system and domestically; PACT has developed a refined schematic of how this could work (see Figure). For the planning phase, countries develop and communicate their nationally determined contributions (NDCs) and can use indicative information on future financial support to identify opportunities to go further and faster. In the implementation phase, countries work to meet their contributions and report on their progress to the international community as well as to their national stakeholders. Finally, in the review phase, countries participate in a technical expert review of their individual efforts, then share their experiences and best practices. One of PACT’s foremost recommendations is that Parties to the Paris Agreement should decide on a common timeframe for NDC implementation periods. This would benefit everyone, as it would allow for more accurate aggregation and assessment of collective progress. In turn, this would allow all Parties to pull together to increase their level of collective ambition, correspondingly – to meet the Paris Agree­ment’s goal of limiting global average warming to 1.5 degrees Celsius. PACT suggests that countries should agree to submit NDCs using a common timeframe beginning in 2025. A common implementation period should be five years and that, starting in 2025, Parties should submit NDCs with a target end date ten years after the submission of the NDC. Many of the team’s recommendations on ambition and reporting around climate change mitigation and adaptation are also geared toward reaching common standards – and so making it easier to assess whether governments are collectively on track for the Paris Agreement goals. For example, on mitigation, Parties that have set targets for greenhouse gas emission reduction should at a minimum use a common balance sheet, which the UNFCCC could provide. On adaptation, countries could embrace the following common reporting elements: national circumstances; impacts, vulner­abilities, and risk assessment; adaptation priorities, plans, policies, and strategic and planned actions; and adaptation support needs for developing countries. There is much work to be done in Bangkok in the coming week, but with these and other practical suggestions in the PACT paper, climate negotiators could make substantial progress toward the ‘Paris rulebook’ that they need to finalise in Katovice by the year’s end. Image: The moment in Paris, France, in 2015, when the Paris Agreement on Climate Change was passed by Parties to the UN Framework Convention on Climate Change.